Alban tackles every assignment knowing that each vessel, large or small, has its own unique requirements. Together with you, our aim is to fill those requirements as efficiently and economically as possible. If there is a marine engine challenge beyond Alban's capability, we have yet to come across it. To give Alban a try, simply give Alban a call at (301) 355-6700. Bethlehem has entrusted the fabrication and supply of the auxiliary marine generator package to Alban. Alban Engine Power has the credentials to back up its claim to be one of the most experienced full-service Caterpillar marine specialists in the country. 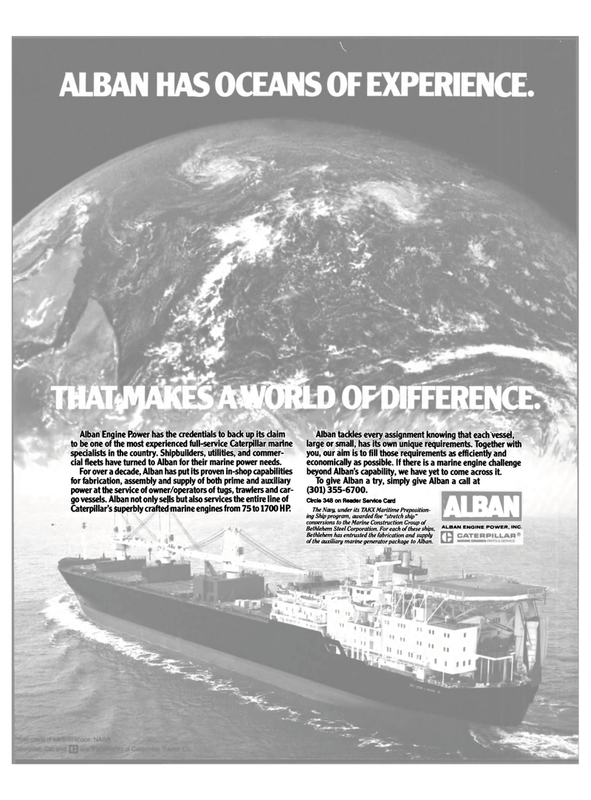 Shipbuilders, utilities, and commer- cial fleets have turned to Alban for their marine power needs. Caterpillar's Superbly crafted marine engines from 75 to 1700 H P.